Datasheet of the DENQBAR Inverter power generator DQ-2800E to download. The pictured federal environmental symbol "Blue Angel" (German Ecolabel) was awarded to DENQBAR Inverter power generators as proof of its special environmental friendliness. The "Blue Angel" is the first and oldest environmental protection label in the world and was launched in 1978 by the environment ministers of the federal and state governments. The inverter power generator DQ-2800E was not only convincing low noise emission values, but also the low waste gas emissions contributed to the awarding of the coveted Federal Environmental Seal. 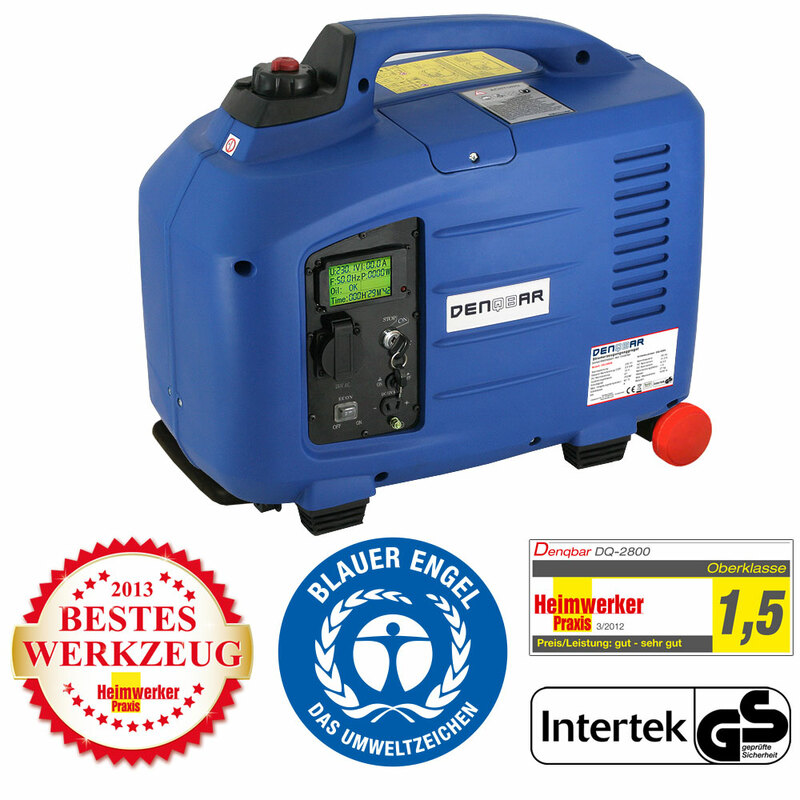 The independent trade and test magazine Heimwerker Praxis certifies a high-quality standard for the DENQBAR inverter power generator DQ-2800E and rated it with the overall grade of 1.5. Especially in price-performance-ratio, the mobile power generator has performed well / very well. "A very good generator that is easy to move and easy to use." is the conclusion of Heimwerker Praxis. "Geprüfte Sicherheit" (Tested Safety) - The GS mark confirms this product to be safe, legally valid and of high quality. We have voluntarily subjected our product to a stringent quality control by an independent licensed notified body. This certification has been awarded by Intertek with the Certificate No 17SHS1883-01. Mobile power generators are among the most useful appliances in the household and enjoy great popularity, especially in rural areas. Especially in emergency situations, e.g. a major power outage or even a complete blackout, mobile power generators provide valuable help as emergency power generators. However, DENQBAR's inverter power generators offer countless other applications for our customers - the possibilities are endless! Modern electrical appliances can be well protected from damaging voltage fluctuations with our powerful DQ-2800E, as it reliably transforms direct current into alternating current at a constant frequency. With a maximum power of 2.8 kW, he also has enough power, so outdoor enthusiasts, travellers in motorhomes or garden lovers do not have to manage without a reliable power supply. The gasoline-powered inverter power generator runs remarkably quiet, clean and economical. The fuel tank of the DQ-2800E contains 7 litres of gasoline, providing you the power of the device for up to 14 hours. The technical refinements include amongst others a clear LCD display, which is especially user-friendly. At a glance, you are informed about important details, such as the voltage delivered, the current output or the operating hours. In addition, with the built-in electric start, the ease of use has been raised significantly.